Recruiting starts now so it’s that time of year when players and parents begin the process of deciding which team/program will be the best fit for his or her child. During this process, A lot of promises are being made, and through this note we want to make sure you know as much as possible about the reality of what is available, and more importantly what questions we would suggest you ask and research, and factors we feel are crucial to making the best decision for your child. Doing the research on your child’s head coach is the most important facet of this recruiting process. He/She is the one person that will most affect your child’s and your experience. What is their track record of developing teams? What is their track record of individual skill development? How are practices run? What do they do for off ice w/the team?-video breakdown, meetings. What is their ice time philosophy? What is their practice & game personality? How well do they communicate with the players? How well do they communicate with their parent group? Who are the assistants and what are their roles? How do they handle player feedback for improvement? There are some very good recruiters out there, some very charismatic coaches. But, does this coaching staff have development as priority #1. Also be careful on how you are getting your information? Be very careful about who you put stock in, when it comes to listening to rumors and opinions. The hockey world is notorious for rumor spreading, and partial truths. GO TO THE SOURCE! Discern the differences between fact and opinion by asking the coach direct questions. Do not accept as fact the message board propaganda, or the biases of a parent who is certain the coaching staff conspired to prevent the child from becoming the next Patrick Kane. That does not mean they’re always going to tell you what you wanna hear, but it doesn’t mean they’re always going to teach your child what he or she needs to learn. As a parent, your job is to walk that fine line between advocating for your child, but not becoming “that parent”. Asking questions of coaches should always be aimed at keeping a player-first mentality for everyone. WHAT ABOUT THE PROMISES OF ICE TIME? Here’s a question I’d ask you as a parent. If a coach makes a lot of ice time promises, why would you want your son or daughter to play for someone who would not hold him or her accountable? The real hockey world, the one where there is no age restriction, the one where coaches are hired and fired based on wins and losses is a tough world to survive in. A coach needs to prepare your child for that world and teaching them accountability is part of that process. At times, that’s difficult for parents to understand but everyone has to run their own race as they move along in life. Aside from the sad parents who are a part of the college admission scandal…. let me ask you this; would you only send your child to a school that guarantees him or her an A on every subject on every report card? Ice time should never be promised up front by any coach. period! The older you get – Ice time is typically based on Merit, Hard Work, Practice Habits, Knowing your Players in Situations, Score, Match Ups. WHAT’S THE TRUTH ABOUT FINANCIAL AID? No team can legitimately offer you or your family financial aid without having your actual financial need determined by a third-party agency. You risk NCAA sanctions if this procedure is not followed. If you have legitimate financial need, most AAA clubs will try to help you. But some programs will lie or make outlandish promises that may, someday, jeopardize the ability of your child to play college hockey. Most programs will set up a payment plan to help ease the burden of hockey expenses. If you get promised something, get it in writing. If the coach is not willing to put it in writing, that’s a huge red flag! As everyone’s season ends or winds down, it is inevitable that talk begins to swirl about “next year.” One thing that never changes, however, is the fact that at this time of year, overzealous coaches, parents, and clubs begin trying to recruit and posture with an eye towards “next year.” I call this to your attention as a two-part reminder. First, “next year” always takes care of itself. You will have a minimum of several weeks, and likely much longer, to make decisions about what to do next year. Many of you will need that time to assess your options, so engaging in decision-making for next year before this year concludes is, frankly, bad business. As a parent, we want you to always choose a program that offers your child the best developmental experience, and you should do so with vigilance …at the right time. Secondly, that “right time” to choose is not now. Take some time this spring and research the coach, research the program and see if it is a good developmental fit for your child. 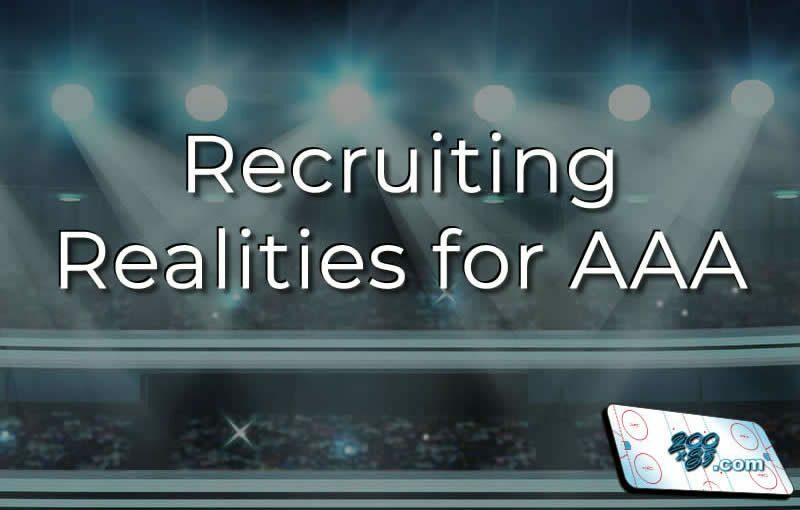 Next up… suggestions to Coaches on how to handle recruiting.